We have added a page template called “Contact Page” which is set up to display contact details, a contact form and a map. To create a page like this, add a new page in WordPress and, at the right-hand side where there is a box named Page Attributes under Template, choose Contact Page. To configure your contact settings, go to the theme options panel then Contact → General. Fill out the fields with your settings and enter your map image or iframe HTML in the box. 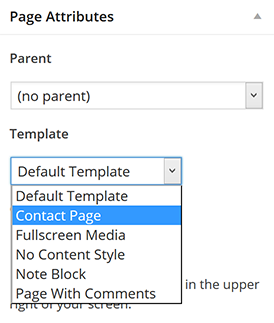 At the Contact page template form setting, select a form from the list. If there are no forms there, create a contact form using Quform or import one, then go back to the theme options panel and select the contact form.